How high can you score in this VR version of Flappy Bird? Here’s the latest title to make my list of games I’m terrible at but love playing. Cardboard Flappy for Android is a 3D version of the challenging mobile game Flappy Bird in which you attempt to navigate past endless obstacles — only this you literally get a bird’s eye view of your flight. The original 2D version had you tapping the screen to guide a bird through gaps in vertical pipes as it continuously flew to the right. 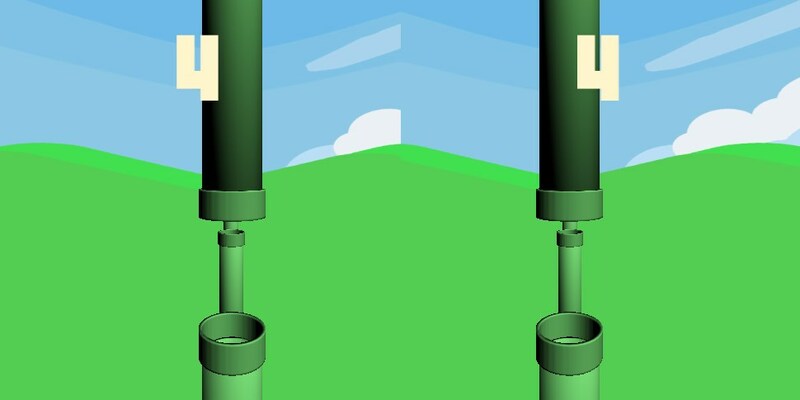 This time, you see what the bird sees: pipes, pipes and more pipes with gaps at varying heights for you to slip through. All you need is your Android phone and a Cardboard headset. You’ll only need the headset trigger to play this one-button game; use it to make the bird flap its wings and ascend in the air a bit as it flies towards the pipes to guide it through the gaps. Thankfully, you don’t have to use your head to control the game — controlling all that aerial bobbing and dipping would likely give you a headache. Cardboard Flappy is available for free on Google Play. Good luck beating my top score of 3!